A week ago I wrote a post on Eco-Friendly Beauty Habits. A couple of our readers then commented that they use the Oil Cleansing Method (OCM) to remove make-up and wash their face. Of course I was intrigued so I sat down and read about how a combination of Caster Oil and Olive Oil or Sunflower Oil, can be used to deep clean and moisturize your face every evening. I know, it doesn't make sense at first that oil, which we are usually trying to remove from our skin, could actually deep clean it. Well, you know I just had to try it out! After reading the directions thoroughly, I ran to my local drug store to pick up some caster oil. You may already have this around your house. Then I reached into the kitchen cabinet for my trusty olive oil. Based on the recommendations in the OCM post, I prepared 25% caster oil and 75% olive oil. As I have aged my skin is a little dryer in spots, but I still have oil in the T-zone of my face. I just used a teaspoon of caster and three teaspoons of olive oil to keep it simple. You may require more or less caster oil as it does have a drying effect. I should probably back up a minute here before I let you know how it all turned out. Lately my skin has been kind of a nightmare. I have been breaking out around my chin, clearly PMS related acne and then recently at my temples and hairline, I have developed a bunch of small bumps and little red pimples. The kind you could really go crazy picking at. I also just switched daily cleansers and spent a lot of money on a daily 'anti-aging' moisturizer. I am officially middle aged in May and thought that maybe I should try heading off those fine lines and wrinkles at the pass. So anyway, I headed to the bathroom, pulled my hair back, started running the hot water and poured the oil mixture into the palm of my hand. I was somewhat worried that I could wake up the next day with even more blemishes. According to the OCM, you should warm the oil between your hands and then start spreading it over your face gently massaging it into your skin. I spent extra time around my nose, chin, temples and hair line. Gosh it felt good. No harsh particles rubbing on my face, no strong perfumy smells and I could feel the eye make-up and mascara melting away. Once I was confident that all my make-up was removed and I had thoroughly cleansed, I began the rinsing process. I placed a steamy hot wash cloth over my face and just held it there until it cooled. I repeated this step 3 or 4 more times gently running it over my face and eye area to remove any leftover mascara and oil. Once done, my skin felt clean and moisturized. Since I tend to feel dry around my eyes, I added a dab of the oil mixture underneath them, gently smoothed it in and left it. The next morning I was amazed. My skin still felt clean and my problem areas showed signs of clearing up. I noticed right away the some redness had subsided and that my skin didn't have the look and feel of irritation I had been experiencing. The next concern...you are not supposed to wash your face in the morning. Since I go to the gym in the morning I just went and did my workout without touching my face then simply rinsed in it in the shower afterward. I did feel a little dry under my eyes again so I dabbed some more oil in that area, applied my make-up as usual and repeated the OCM that night. Final observations, my skin was less oily looking during the day. I was clearly not over-drying it so it wasn't over-producing and it looked and felt even better on the second morning. I am a believer! Of course I mentioned this to both Karla because I know she would want to try it too and my mom, who suffers from Rosacea and can't use many commercial cleansers and moisturizers due to their content. Curious to hear what everyone else thinks. Next I am going purchase some Coconut Oil, also recommended by one of our readers, to use as a body moisturizer after showering. Once again, no chemicals, inexpensive and easy! 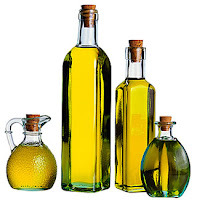 Check out VitaCost for great prices on Caster Oil, Sunflower Oil and Coconut Oil. I just purchased my caster oil today and am really excited to try the OCM tonight. I've had alot of issues with my skin lately, I can only guess due to detoxing from all the great fresh fruits and vegetables I've been eating. I will let you know how it goes! It just goes to show how far up the garden path we've been led by the cosmetic companies... and all the time the answer's been in our kitchen cupboards! And it's brilliant for removing mascara! I love the feel and texture of my skin now and also just rinse it after gym. I dab some coconut oil around the eyes if I feel dry, but the need for that has definitely decreased in the last few weeks. Mary-Ann Shearer says when she works with avocado in the kitchen, she doesn't rinse her hands afterwards, she rubs the excess avocado into her skin. Makes sense, doesn't it? Thanks Hanlie. I am loading up on all my oils. It is amazing how I still have these thoughts that maybe I need a miracle cream, but then I stop myself. Just years of marketing rattling around in my brain. Thanks for the informative post. I've been wanting to learn more about the Oil Cleansing Method ever since I saw it on Hanlie's blog so discovering this post today was timely. I have been only using olive oil soap occasionally (like maybe twice a week!) for the most part the last several months and otherwise just rinsing and using coconut oil on my skin everywhere, including my face and my skin is pretty great, but I'm thinking this method with the steam will be more useful -- plus feel great. First of all we are glad you found us too! I have continued to use the oil cleansing method, its been a little more than a week and my skin is better than ever. I am definitely going to continue! I'll try making my own. Thanks! Arianika, you should definitely try making your own. I am still cleansing this way and love it. It is a great make-up remover and leaves your skin feeling clean and moisturized.